Some of the 150 El Al passengers who unexpectedly spent a Shabbat together in Athens. Passengers on what started out as direct El Al flight LYO2 to Israel from New York arrived safely back in Israel early Sunday after a Shabbat-long diversion in Athens that gave 150 at-first extremely disgruntled travelers the bonding experience of a lifetime and the Chabad-Lubavitch emissaries of the city the chance to strut their stuff. After much pandemonium due to reportedly mixed messages from El Al about the cause of what turned out to be more than a three-hour delay on the tarmac at JFK Airport on Thursday evening, the plane took off, despite the requests of many passengers to disembark for fear the flight would not make it to Tel Aviv before Shabbat. The watchful passengers eventually did disembark prior to their scheduled destination, but not until hours later, when El Al announced that the flight would not, in fact, make Tel Aviv in time for Shabbat, and so diverted the plane to Athens. While the decision caused some further confusion and consternation about how Shabbat would be kept in Athens on about an hour’s notice, the story for the most part at that point began to turn from worry and concern to relief and calm —and even elation for at least one of the passengers featured in a social-media post. The mood change, largely generated by the certainty of being able to keep the weekly Jewish holiday even under extenuating circumstances, was further evident on one of the transport buses shuttling some of the passengers from the airport to their Shabbat destination. There, mostly Chassidic passengers could be seen in a video dancing while chanting one of the well-known sections of the Friday-evening prayers: “Those who observe the Shabbat and call it a delight shall rejoice in Your Kingship,” as the English translations goes. What the passengers didn’t know at that moment was what was waiting for them at the hotel that the airline had booked: a full-course Shabbat meal, prayer-hall accommodations and arrangements for customary Shabbat learning sessions, compliments of local Chabad emissaries Rabbi Mendel and Nechama Hendel. The couple, who have co-directed the Athens Chabad center since 2001, were alerted about the incoming flight and situation around 11 a.m. (Athens time) on Friday. By 4 p.m., they had put together a lavish Shabbat spread for what was actually more like 150 people, according to the account of another passenger. The travelers from all Jewish backgrounds—held together by the mutual desire to keep the Shabbat—had been told only on the plane that Chabad would be helping out once they arrived in Athens. 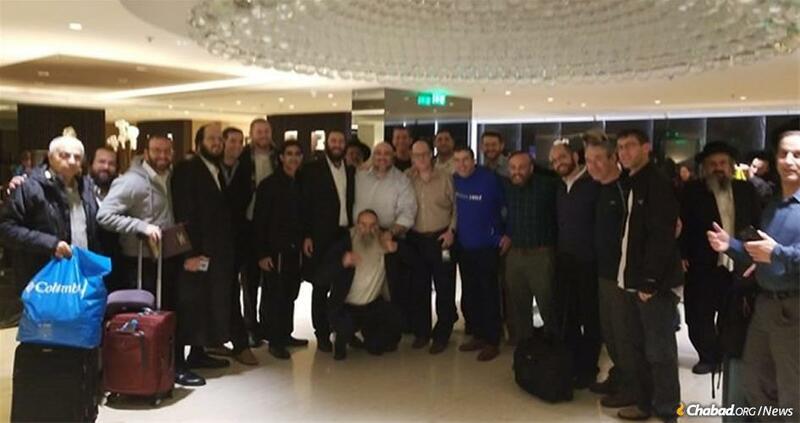 To their further relief upon entering the hotel lobby while frantically rushing the reception desk to check in—clock ticking—they learned from hotel personnel that Chabad had a full Shabbat meal and program planned. One of those passengers was Shalom Lipner, former foreign-policy adviser to the Prime Minister’s Office in Jerusalem and currently a non-resident senior fellow at the center for Middle East Policy at the Brookings Institute in Washington. He was on the flight with his wife, returning home to Israel after a trip involving a joyous occasion and business engagements. Another passenger, Ben Chafetz, provided much detail about the whole flight and Shabbat stay that also focused on the theme of how Jews from far-flung factions came together under trying circumstances to create a positive experience. The travelers were from all Jewish backgrounds, brought together by the mutual desire to keep Shabbat. It was the work of the Hendels, honed and talented from years of welcoming large groups of expected and unexpected guests, with the grace of Shabbat hospitality. 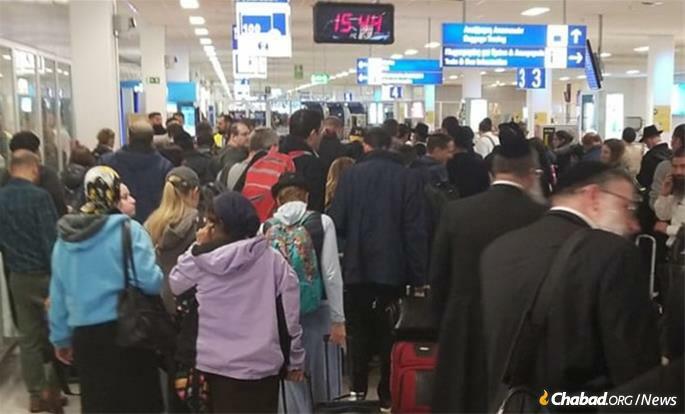 After being alerted about the incoming flight by an assistant of passenger Rabbi Shalom Ber Sorotzkin, who heads Yeshivas Ateret Shlomo of Beit Shemesh, and shortly after by the local El Al office, the Hendel’s kicked into action. They also arranged for a Torah scroll, prayer books and Chumashim (copies of “the Five Books of Moses”), Shabbat candles, materials for the concluding of Shabbat prayer, called Havdalah, “and whatever else was necessary for a proper Shabbat,” said Hendel. With the help of El Al, the couple was also lodged in the airport hotel, the Sofitel, a 45-minute drive from their Chabad center in downtown Athens—for the Shabbat experience. “People were so appreciative of how beautiful the Shabbat turned out that when they learned we are in the middle of a mivkah [ritual bath] building project, they really wanted to help,” added Hendel. He said that Rabbi Akiva Katz, head of the United Kashrut Authority in Jerusalem, who was on the flight, made an impromptu fundraising effort to help complete the project, with Rabbi David Derli, who heads Tiferet Tiberias institutions in Tiberias, pledging a significant amount personally and encouraging others to help. “If by Divine Providence you find yourselves in Athens, it’s to help accomplish something positive,” Derli said in his pitch about the project, being built with help from Keren Mikvaot and the Rabbinical Center of Europe. It was not easy to say farewell to their impromptu guests after all that developed over Shabbat, though happenstance brings new situations of similar nature on a regular basis and there’s always more to look forward to, said Hendel. The couple, with the help of their staff, packed up and went home. As for their guests, upon return from the trip on a flight that departed late Saturday night and landed only a bit delayed this time— 1:45 a.m. Sunday in Israel—the group belted out louder than usual the standard end-of-flight cheers, then broke into song again on the theme of Shabbat delight, shared Lipner. I understand that some time has passed from the fact, but I want to bring another similar testimony. The incident happened years ago at Fiumicino airport, when the ElAl flight that was to go to Tel Aviv did not arrive because of problems in the Paris airport. I say immediately that overall all went well, but some "details" could be much improved. For example, the information provided by ElAl to the passengers who have been somewhat lacking (until the last we did not know if and when we would leave ...). However, once we understood that there would not be a substitute flight soon, the ElAl, as usual, took us to the nearest hotel (Hilton) to spend the night. Fortunately, a passenger, who is a professional Mashghiach, intervened, but even had to convince the ElAl and hotel representatives to allow him to organize a kosher meal. Running and tired, in the end, however, he succeeded and everyone who ate kosher breathed a sigh of relief. But it did not end here. When it was explained to them that it was possible to quickly prepare food that was kosher and therefore there was no time to make elaborate courses, but that in any other part of the room, non-kosher food was also available, these gentlemen, Israelis told us they were very angry, because the fact that we had organized a kosher meal had given them the chance to have less non-kosher food that they preferred. In short, according to them, we did not have to eat so that they could have much more food! Really an absurd situation. Despite this, however - B "H - everything went well in the end. The obvious solution to this problem is to plan ahead and not travel on Friday. There may have been others who didn't want to stop in Athens and they were inconvenienced. A Chabad rabbi I know bragged in a sermon how he and his family forced their way off a plane even though they were told they weren't allowed to get off. Chilul Hashem behavior on the plane It is great that Chabad took care of the stranded passengers in Greece due to the El Al Plane delay. Chabad should be commended for their act of Chesed. Well, all the biased fake news says everyone got violent. I doubt that. Upset, yes, i would be, but not violent. This was just the most positive beautiful story I've ever read. I cried all the way through it.